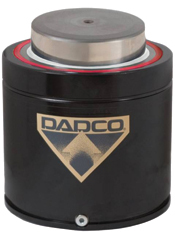 Dadco, Plymouth, MI, has added the new UX.20000 nitrogen gas spring to its Ultra Force Extended Series lineup. The 22-ton UX.20000 fits the standard 10-ton ISO standard-size full-height gas spring envelope with nearly twice the amount of force on contact, the compa ny says. It has a 195-mm-dia. body, 130-mm-dia. rod, and is available with a stroke length of 25 to 200 mm. The spring has linking ability through its G 1/8 port and comes in a variety of mount options. It directly upgrades ISO 10000 models.